What do I do when my Alton, IL furnace blows cold air? When it is cold outside, you expect your furnace to blow hot air throughout your home to keep your family warm and comfortable. When the furnace blows cold air, it can be frustrating. Below are six common reasons why your furnace might be blowing cold air. If your thermostat is in the “on” position, the fan continues to run even though the furnace is not on. Therefore, the air blown through the vents might appear cool. Try switching the thermostat to “auto,” so the fan only runs when the furnace is on. If your gas furnace is an older model and is blowing cold air, the pilot light might be out. This is a common cause of furnace problems for older models. If you are comfortable re-lighting the pilot light, you can follow the instructions in the manufacturer’s operating manual. You can also call our Alton, IL furnace repair experts to make sure that the light is lit safely. An air filter that is dirty can limit the airflow into your furnace causing several problems, including cold air coming from the vents. Replace or clean the filter. If you still experience furnace problems, you could need a more serious furnace repair. Call our heating repair company for service. If the gas supply to your furnace is turned off or you have a gas leak, this could cause the unit to blow cold air. If you suspect a problem with the gas line, turn off the gas to your unit and call our Alton, IL heating contractors immediately. If you have holes in your ductwork, the hot air could be escaping from the ducts before it reaches the vents in your home. 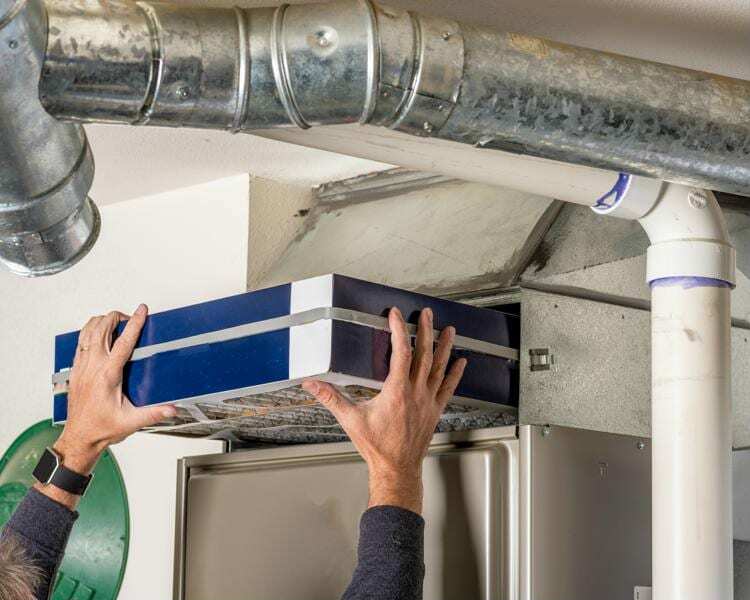 Contact a heating and air conditioning professional to inspect the ductwork in your home to determine if this is the cause of cold air coming from your furnace. If your furnace is an oil-fired furnace, a clogged oil filter could be the cause of cold air coming from the furnace. You can clean or replace the oil filter if you know how and you are comfortable performing this furnace repair. Otherwise, our heating contractors are happy to do this for you. If your furnace is still blowing cold air, there could be a severe problem with your system. The heating contractors at B & W Heating & Cooling will diagnose the cause and perform the necessary furnace repairs to get your system operating again at peak performance.